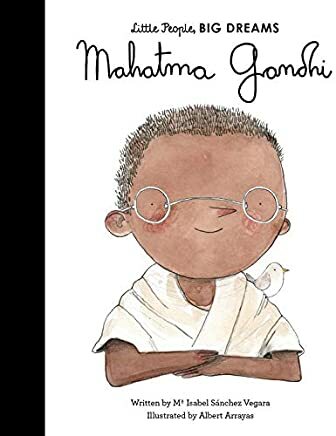 Arrayas’ captivating illustrations add a sense of whimsy to this picture book biography of Gandhi, a man deeply invested in justice. The text explains that Gandhi studied in London, and then moved to South Africa to practice law. While in apartheid South Africa, Gandhi was forced off a segregated train, which prompted his first peaceful protest. Sanchez Vegara’s focus on big events, and the quick passage of time, represents Gandhi as more myth than man. His personal life is absent from the text, as are concrete instances of adversity. As a result, opportunities to humanize Gandhi as well as educate children about cultural diversity and political history are missed. I love Quarto Publishing Group – Frances Lincoln Children’s Little People, Big Dreams series, but this is not their strongest offering to date.